While the presence of bald eagles has been noted in all U.S. states except Hawaii, their existence in North Carolina, until late in the twentieth century, has seldom been recorded far from the larger rivers and bays of the Coastal Plain. At the time of the first European settlements in the region, the only large bodies of water capable of providing the predominately fish diet of the bald eagle were confined to the eastern part of the state. John Lawson made the first mention of the bald eagle in A New Voyage to Carolina (1709), reporting that "they prey on any living thing that they can catch." Naturalist William Bartram, writing in the 1770s, described the bald eagle as a coastal bird in the Carolinas. Alexander Wilson, the "father" of North American ornithology, did the same in the 1820s. In the eras of these men, eagles probably nested every mile or so along the North Carolina sounds and coasts. Early sightings of golden eagles in North Carolina were largely confined to the western mountains. 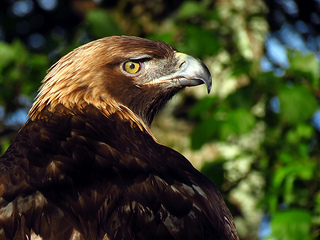 The eagles of Cherokee Indian legend and lore were most likely golden eagles, whose distribution includes all of the northern hemisphere. However, Native Americans may have seen some migrating bald eagles following the mountain ridges south in the fall. Over time, several factors contributed to the decrease in eagle populations in the state. By the mid-twentieth century most of the wild, watery habitats and large ancient trees needed by eagles to support their huge nests (up to 10 feet in diameter, 15 feet deep, and two tons in weight) had been supplanted in North Carolina by farms and young woods springing up in abandoned fields. Many eagles were and still are targets of hunters despite federal and state laws protecting them. Lead shot, used by duck hunters, also poisoned eagles feeding on dead and dying lead-contaminated ducks. Most deadly of all, greater use of pesticides such as DDT-used extensively on cotton, tobacco, and a variety of food crops-after World War II had a devastating effect on birds and other wildlife, particularly those high on aquatic food chains such as pelicans, osprey ("fish hawks"), peregrine falcons ("duck hawks"), and bald eagles. Derivatives of DDT caused the birds' eggshells to thin and break during incubation. I n North Carolina only one active bald eagle nest remained by 1970, and between 1973 and 1983, no eagles nested in the state. DDT was banned throughout the United States in 1973, and the persistent poison slowly diminished its impact on the North American environment. In 1983 ten Alaskan eaglets were raised and released at Lake Mattamuskeet in Hyde County in an attempt to reestablish a North Carolina population. Within weeks seven died of avian malaria carried by Carolina mosquitoes (Alaskan eagles had no resistance to this southern disease). Attempts at reintroduction were terminated. Meanwhile, many new reservoirs had been built throughout the Piedmont to provide drinking water, flood control, power, and recreation for the rapidly growing cities of central North Carolina. 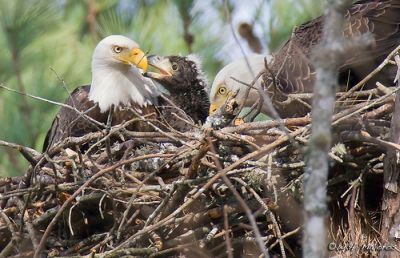 At the same time, Florida and Chesapeake Bay eagles were beginning to hatch healthy eaglets again. Occasionally adult and immature eagles appeared at Kerr Lake, Lake Norman, and then Jordan Lake when it was filled in 1982. In 1984 a new nest near Lake Mattamuskeet fledged two eagles, the first successful nesting in North Carolina since 1973. Early one April morning in 1985, a lone kayaker spotted seven bald eagles roosting in a single tree on Jordan Lake. Monthly counts organized by the New Hope Audubon Society documented a summer roost concentration of about 35 bald eagles on Jordan Lake. Five to ten more were noted on simultaneous counts at nearby Falls Lake every summer. The summer count numbers on Jordan Lake twice rose to more than 60, with 15 to 20 staying on the lake through December. North Carolina had won the honor of hosting the largest summer population of bald eagles in eastern North America. Even in the winter, ten or so eagles remained on Jordan Lake. A new high of 69 wintering eagles was recorded for all of North Carolina in 1992. The number of attempted nests in North Carolina grew from one nest in 1984 to eight nests in 1990, including two unsuccessful Piedmont nests, one of which was built on Jordan Lake. By the early 2000s it had become clear that bald eagles had not only returned to their ancestral nesting grounds of the Coastal Plain, but they had also established, with help from human beings, new territories in the rapidly developing North Carolina Piedmont. Golden Eagle, Grandfather Mountain, 2012. Image courtesy of flickr user BlueRidgeKitties. Available from http://www.flickr.com/photos/blueridgekitties/7343606312/ (accessed October 10, 2012). Bald Eagle Nest, NC, 2009. Image courtesy of Bill Majoros. Available from http://www.flickr.com/photos/thirdbirdfromthesun/3796126779/ (accessed October 10, 2012). On our ride down to Greensboro from Montclair New Jersey we changed our direction due to suggestions by driving APP Waze & just before NC, on highway 29; I counted 17 eagles during that almost two hour drive. I observed an adult bald eagle perched in the top of a tree in the Ellendale Community of Alexander County at 7:30 am on 10/12/17. It remained atop the tree for about ten seconds after I spotted it, then flew low over a pasture in an easterly direction. I have been watching for it since, as it was quite a thrill. Saw what appeared to be a golden eagle flying low as I was driving on 98 at Falls Lake on my way home today!! Head slightly lighter than body from side view and otherwise dark color all over. Flew out and over my vehicle approximately 5-10 feet in front and above me. I was able to see the birds whole left side and got a good look at its underside as I drove under it. A very large raptor.